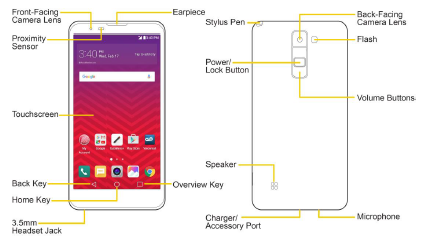 The LG Stylo 2 user manual provide detail reference information such as device layout, Set Up Your Phone, tutorial Insert microSD Card and formatting, Use the Touchscreen, using QWERTY Keyboard on page 28, Create a Google Account, Lock and Unlock Your Screen on page 36, Update Your Phone Software, Configure Visual Voicemail Settings on page 56, import and backup contanct, Set Up an Email Account, etc. Then about using internet and social networking, using browser, Configure Wi-Fi Settings, Pair Bluetooth Devices on page 96, using camera, tutorial record video, edit pictures and more. Other important information such as phone settings guide like network settings, vpn settings, display and sound, Battery & Power Saving, Virgin Mobile Account Information and Help on pgae 152 and more.